Before designing a landscape you must first think of how you would like to use the space. Once you know how you would like to use the space you must factor in sunny areas, shade areas, wind direction and water drainage. think of how you would like to use the space. in the harshest Buffalo, NY weather conditions. Chris Karan, landscape designer and owner of CJ Cutting Edge has over 10 years experience designing landscapes in the Buffalo, NY area. Landscaping does not have to stop at plants and shrubs, the addition of a Hardscape such as retaining wall, patio or outdoor kitchen are all great additions to any landscape. Utilizing our knowledge of plants, strong and proven work ethic we will work with you from beginning until end. It is important that landscapes have plants planted in the correct area i.e. if you plant a shrub that will have a mature height of 15’ in front of your window you will be highly disappointed in years to come. As part of our design process we will take before photos of your property to create our 3D virtual landscape design. We understand that not everyone will be able to identify a plant based on its botanical name therefore we have made the design process friendly and inviting for all as we will walk you through a virtual 3D design, allowing you the ability to see your landscape at full maturity. Our staff at CJ Cutting Edge utilizes commercial grade equipment to install your landscape correctly, efficiently and safely. Working safely is a high priority at CJ Cutting Edge, that includes maintaining a clean work site throughout the installation not just at completion. 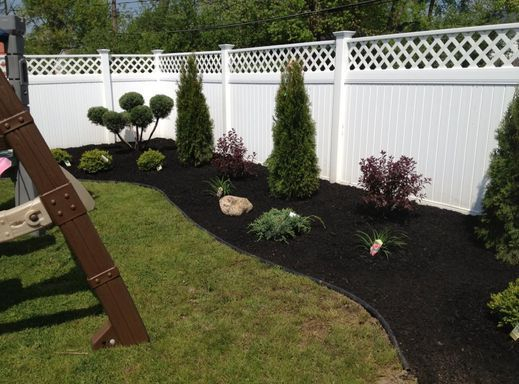 Landscape maintenance is the final step of our landscape design and installation. Upon completion of your landscape we will offer a maintenance package which will include a monthly inspection of all plants, shrubs and trees along with trimming and pruning when necessary. Frequent landscape maintenance will help prevent disease, and keep your landscaping looking its best for years to come. In the fall we will wrap shrubs in burlap and cut down all ornamental grasses, perennials etc to prepare for the harsh winter weather in Buffalo, NY. © 2016 CJ Cutting Edge . All Rights Reserved.